spent a week working undercover in several of his company’s plants. LONDONDERRY -- Many people ponder what it might be like to walk in another man’s shoes for a day, but few get the chance to actually do it.But thanks to the workings of an innovative reality television series, Londonderry resident Ron Croatti recently had the chance to do exactly that. Croatti, the CEO and president of UniFirst, a Wilmington, Mass.-based company that supplies uniforms and related products to companies such as Wal-Mart, Costco, and General Elec­tric, recently joined the ranks of assembly line workers for an episode of CBS television’s “Undercover Boss.” Croatti’s episode, which was filmed several months earlier, aired Jan. 9. As head of a company with more than 75 years of family history, Croatti, who has lived in Londonderry for more than three decades, said he welcomed the experience to get to know some of the extended members of his work “family” in ways his current position doesn’t allow him to. The company was founded by his grandparents: hardworking, Italian immigrants. Croatti’s entire family was involved in the business, a tradition that continues today. When his grandfather died in an industrial accident, Croatti’s father, Aldo, took over. “He was able to build up from a small business with two or three employees,” said Croatti, who began working for the family business in his early teens. He eventually met his wife, Carol, a former UniFirst worker. The couple has been married for more than 35 years. Croatti became company president in 1995. Today, Uni-First boasts 10,000 employees at more than 200 locations in the United States, Canada and Europe. 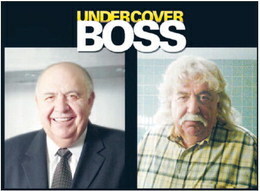 During his appearance on “Undercover Boss,” however, Croatti was just another face in the crowd. “They were looking for someone in the garment manufacturing business and they came to us,” Croatti said of the show’s producers. “When we explained what we do, and told them our size, they were interested right away.” In the program, an incognito Croatti posed as Mike Daniels, a former hobby shop owner looking to return to the work force because of the recession. Sporting a white mullet wig, fake mustache and Dickies pants, Croatti worked brief stints at plants in Kentucky, South Carolina and Oklahoma. His fellow “employees” were led to believe he was one of several candidates looking for work, and were interviewed on his progress for what they believed was an unrelated television show placing them with the task of voting on the most qualified candidates. Some of his out-of-state employees were later asked if they’d hire “Mike.” Even though some didn’t vote in his favor, Croatti said he was nevertheless struck by their kindness. “You had patience with me, showing me what you do,” he told one worker. “I want to make people’s life easier, and make sure everybody is aware of everything you do. “Some of those jobs I haven’t done in a really long time,” he noted with a chuckle. “I don’t have the dexterity some of them had.” While working in the seal and sew department at the Kentucky plant, Croatti appeared frazzled when he realized he was expected to heatseal 100 emblems an hour on work shirts. His first attempts at using the heat seal machine weren’t exactly successful. “I think we destroyed a shirt here,” he joked with the young woman training him: later he got to know Dee Dee a little better, and learned she worked at the plant to support her three children. Croatti said the experience was an important one. It helped him step away from what he called “the CEO dog and pony show.” In fact, he was so impressed with his workers’ dedication and integrity, one struggling single mom was given $5,000 toward college expenses and Croatti even offered to pay her daycare costs for a year. Others were met with similar benevolence. “It was a fantastic week,” he added, noting the experience served as a strong reminder that those in the boardroom should pause to consider suggestions by those on the front lines. “We observe people doing things: we have to quit observing and do,” Croatti said.